As of version 0.2.7 QATrack+ has a tool for generating (primitive) paper based forms to be used as backup in the event that your QATrack+ server is unavailable for some reason. Currently, to access this tool a user must have the "staff" or "superuser" flags set on their account. To access the tool, select the Paper Backup Forms option from the Tools menu. 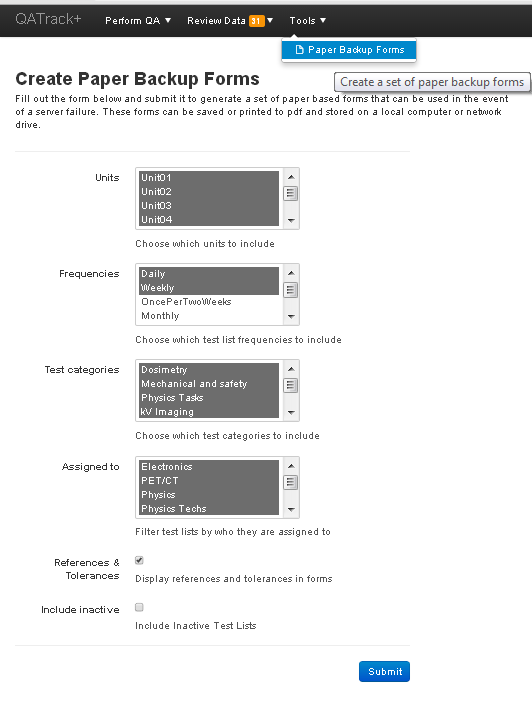 This will take you to a page with a form allowing you to filter which test lists and tests to print by unit, frequency test category, and assigned groups. Optionally you may include the reference and tolerance values for all the tests as well. Once you have set your filters accordingly click the Submit button. This will redirect you to a page with forms similar to the one below. Hit Ctrl-P to print the forms (you can use Adobe or CutePDF to print to PDF). A page break is inserted for every new unit/test list combination.